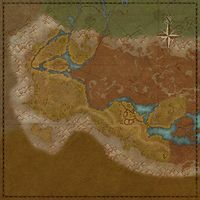 The Ragged Hills is the western region of the Rift. It includes the areas to the west and south of the river complex that flows from the lake in the center of The Rift. The city of Nimalten is found here, as well as the smaller towns of Ivarstead and Geirmund's Hall to the northwest. To the east it extends past Honrich Tower, and also includes a spit of land north of the lake, containing the Faldar's Tooth ruins. The Ragged Hills Dolmen is in the northwestern section, northeast of Geirmund's Hall. Across the river to the north lies the Stony Basin, and the Smokefrost Peaks are to the east. ​ Wormsquasher 5 Defeat Thallik Wormfather and scatter the Worm Cult. This page was last modified on 10 May 2017, at 12:03.